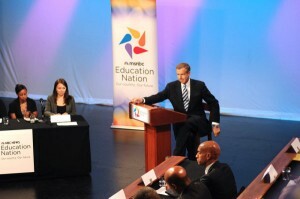 Brian Williams,with his typical off-the-cuff humor, brought the Education Nation events to a close today by gathering constituents from all over the education spectrum: parents, teachers, students, members of congress, governors, mayors, and even the odd musician (John Legend of the Roots). After a few intense days of naming many of the ills of the American public education system, passionate disagreements about the roles of teacher unions, effectiveness of charter schools, political fallouts, and feelings of frustration that the U.S. has fallen so far behind in this critical space, participants offered their thoughtful observations about what to do next. "We have to have buy-in from the community. We can’t [make changes] to our schools, principals, and teachers -- we have to give them greater say. The world is becoming more collaborative, employers are looking for people who can work together to bring solutions to complex problems. That’s the challenge. To have people ready with those skills to step in. The intensity of focus [on education] has waned. All of a sudden we didn’t see that the world had changed, our education system was this huge economic engine, others were also participating in it...This is a policy you have to invest in over and over again." "The common thread for me, after hearing educator after educator say that finding highly qualified teachers is a propriety for everyone, is that while educators want to be accountable for what they’re achieving, that middle piece is missing. Once we get qualified teachers in the door, what are we doing to invest and keeping teachers there. Getting them is just the first step. Keeping them is the biggest challenge. What are we doing on a national level to do teacher development, not just district or state movement." 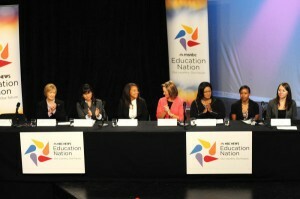 Pictured (l-r) Final Panel Witnesses Marguerite Kondracke, Denise Garrison, Rachel Wise, Karyn White, Gwen Samuel, Pamela Heuer. "We need to figure out how to scale little pockets of success around the country. We have to come up with common sense policies. My students made significant growth in reading, the highest gains in the district. That same year, I was laid off. We need to make sure that we’re keeping most effective people in classroom. If you look at professional sports, we spend tremendous amount of money to make sure we have the most effective people on the field. 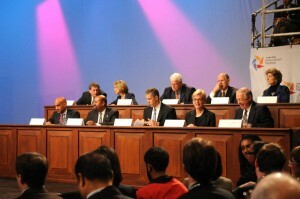 We need to think of education as a sport, and to find ways to keep the most competitive players in the game." "The goal of politicans is to get reelected. Too often that surpasses everything else. If you want do education reform in this country, you have to take political hits. When we closed our schools, we knew there would be political consequences... Teachers unions are on the defensive, and opposed to reform." "Tell me as a parent what my 1st and 2nd grader needs to do to excel academically, not just keep up. Give me as a parent some power, not just hear my ideas, in the decision-making process of what's being done academically, not just with the budget." "We don’t pay enough attention to how we’re spending money in education. We ought to look at how we’re effectively spending money. It's hard to get referendums done. Race to the Top has been fortuitous, but we need to do our share at federal level to make sure we know how to better spend the money. And that might reduce the demand for more money." Arne Duncan, Secretary of Education. "We all have to change. Unions have to change, school boards, politicians. Department of Education has been part of the problem. It's been concerned about audits, check lists, not concerned about transformation. It hasn't been able to support work at a local level. Every single student, parent, teacher, we all have to get outside our comfort zone. Nobody gets a pass in this movement."